What is Recipes Chrome Extension? 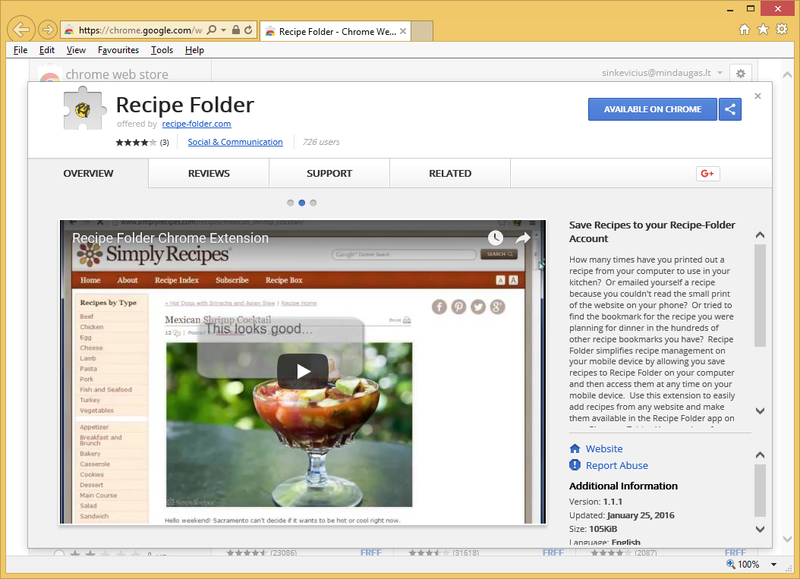 Recipes Chrome Extension is a Russian browser extension that should work similarly to YouTube. Well, at least it is advertised as a tool for watching videos. We believe that it is the reason why some users install this browser extension voluntarily from the web. If you are one of these users or simply have found this extension installed on your browser without your permission, you must delete Recipes Chrome Extension as soon as possible because it is not a useful tool for watching videos online even though it is promoted as one. Malware experts say that users who decide to keep this application active on their computers might even discover malicious software on their computers, so we do not want you to be one of them. Because of this, we highly recommend implementing the Recipes Chrome Extension removal today. You might face some difficulties because browser extensions do not usually have uninstallers and users have to remove them via the browser’s add-ons manager themselves. We will focus on the Recipes Chrome Extension removal in the final paragraph. How does Recipes Chrome Extension work? We cannot confirm that Recipes Chrome Extension is a useful application that will allow you to watch videos online, but we are sure for one thing – it is not a trustworthy browser extension, so keeping it is a risky activity. You should go to uninstall Recipes Chrome Extension as soon as possible not because it is usually installed on browsers’ without the users’ knowledge. We can distinguish two main reasons why it is called an untrustworthy application by specialists. First, it might start displaying all kinds of commercial advertisements on your screen. These ads will not only be very annoying, but they might also expose you to potential threats by redirecting you to untrustworthy pages. Second, it might collect information about you seeking to sell it later to third parties. In such a case, the collected information might even end up in the hands of cyber criminals. If you do not want this to happen to you, you must remove Recipes Chrome Extension as soon as possible. Why do I have Recipes Chrome Extension installed? It seems that Recipes Chrome Extension does not have an official website, which suggests that it might travel in spam emails, in malicious software bundles, or users might download it from P2P pages. It does not really matter now how this malicious extension has entered your system because you, in any event, have to remove it. Read the next paragraph to find more about this procedure. How do I delete Recipes Chrome Extension? It is, of course, possible to remove Recipes Chrome Extension from those affected browsers manually using the add-ons manager; however, we recommend the automatic method for you because you are, most likely, a user who does not have much experience in undesirable software removal if you are reading this article. To implement the automatic Recipes Chrome Extension removal, you need to have a decent antimalware tool, so go to get one from the web first before you take any action.